Tick! That is the sound of checking an item of my bucket list. What was it? Flyboarding. It has been on my “gotta do it!” list for several years. Right next to swimming with manta rays (watch the video here) – which, by the way, felt like I was staring in my own National Geographic movie! 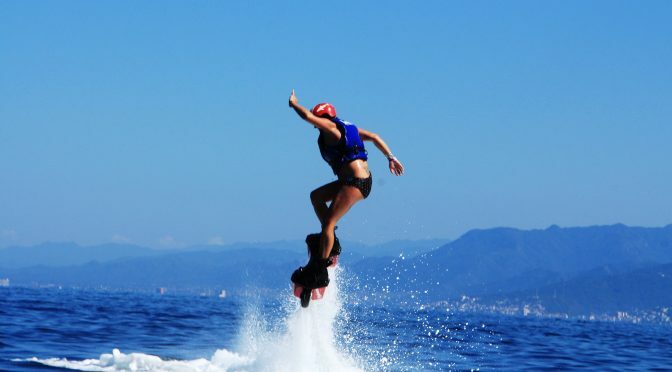 Flyboarding – What is it? Flyboarding is where you stand on a small platform the size of a skateboard that has rigid boots attached to it. The board is propelled via a water tube which is connected to a jet ski. The jet ski operator controls the amount of water in the tube with the throttle. The board then is pushed into the air by jets of water from the water tube. getting the hang of flyboarding. See the water tube behind me. I have to tell you; it was so much fun! I did feel a little like Wonder Girl, hovering above the water watching people swim below me. The crew at Vallarta Adventures were very knowledgeable and insightful in helping me get on my feet, so to speak. It takes a bit of leg muscles to stand up-right. After a few times up in the air I tried my hand at doing jumps. I have a lot more practicing to do to master this technique. Surprisingly, hitting the water in a wipeout did not hurt. I completely expected to feel the stinging sensation of my skin slapping against the water. Like when you do a belly flop off the diving board. It felt like a wave splashing against me or like when you jump into a pool from the edge. The other thing that surprised me, it was a relatively low-impact sport in relation to my joints. Other than taking a fair amount of leg muscles (my legs felt like spaghetti after wards), and being able to balance, it was not that difficult. Once in the air and I found my center of gravity, I could just stand there like I was on the beach. I could look over the horizon, see the fishing and sail boats in the distance and watch people swim. I could even look down in the water and see the shadows of schools of fish. Absolutely! I can hardly wait to strap my feet into those boots again. It was a fun, low-key adrenaline rush. You may wonder what special skills you have to know to try this for yourself. Not much. You should know how to swim, be able to stand/walk without assistance and an adventurous spirit to try something new.